"Coolamon" is an Aboriginal name meaning "dish or vessel for holding food or water". A plan showing the northern boundary of Coolemon (Coolamon) Holes Run in 1870 shows a cluster of numerous water holes which he referred to as Coolamon Holes. This was the Indigenous name given to the holes and the origin of the name as applied today. The name being finalised and the extent of the village and suburban boundaries fixed, the village of Coolamon was gazetted on 3rd October, 1881. 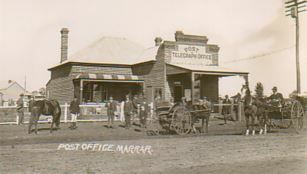 Like so many small towns in NSW Marrar Town had its beginning with the coming of the railway in 1881. A few tents and tin shacks were home for the navvies as they toiled with picks, shovels and hammers to keep the two ribbons of steel moving ever westward. To the rough diamond teamsters, with their horses and bullocks, home was under the big iron tyred wagons. When the weather turned wet, tarpaulins were used to keep out the rain and provide a dry place to do the cooking. Ganmain had its origin for the European Settlers with the arrival of James Devlin between 1835 and 1838. However the name was part of the area long before this and was the name given to the Aboriginal tribal lands occupied by the Wiradjuri Tribe. Many well known names in the area today originate from the Aboriginal language. The village of Ardlethan was given official status by proclamation in the Government Gazette of February 5, 1908, and the first sale of allotments took place on April 14 of the same year. Regular rail services began with the official opening of the line on November 18, 1908 about eight months after the gazettal of the village and the sale of first allotments. By this time, Ariah Street was already taking shape. Ardlethan has not always been known as such. Then the first buildings appeared around the Warri Well the locality was referred to as Warri, after the nearby station. However, with the construction of the railway the platform was designated Rosebank by the railway authorities. Then with the gazettal of the official village as Ardlethan, the railways also adopted the name, and the Postal Department made the change about the same time. The survey for the village of Beckom was made by Surveyor E Herborn at the railway station on March 8, 1908. The station, goods shed, trucking yards and tank were already operating at the time. The village and suburban boundaries of Beckom were proclaimed on September 22, 1909. Beckom is located in the parish of Ariah, county of Bourke. The first sale of allotments took place at Beckom on December 10, 1909. Billed as the 'heart of rural heritage', Coolamon Shire exudes history, character and charm. It's architecture reflects the flourishing economic development that took place between the 1880s and the 1920s. Little has changed since that time, with many of the original hotels, stores, churches and schools still standing. A trip along the Coolamon Shire Heritage Track also provides an introduction to the Shire’s heritage through the “Windows” provided by our buildings. 'Coolamon - Through the Lens', is a two DVD set is now on sale. The DVD project team has gathered video and film footage and pieced it together to create a video history of Coolamon from 1956 to the present day. Footage originally shot by the 1956 ‘Back to Coolamon’ Committee includes footage of the construction of Coolamon’s swimming pool, mobs of sheep in Cowabbie Street and much more. The Coolamon Centenary Celebrations of 1981 are also included on Disc 1 and highlight a week’s worth of celebrations in Coolamon. Disc 2 focus on the rural industries of the Coolamon district and highlight the changing face of agriculture in the district from the 1950’s onwards. The DVD is bound to be a popular Christmas present, especially for those family members who no longer live in the area as well as locals who will see how our community has changed over the years. The DVD has been professionally produced by KEA Productions of Orange, the same group responsible for the production of ‘West Wyalong Memories’ and many hours enjoyment and memories can be assured with this DVD production. The DVD cost’s $25.00 and are available from the Up-to-Date Store, Coolamon Newsagency and Coolamon Council Offices.